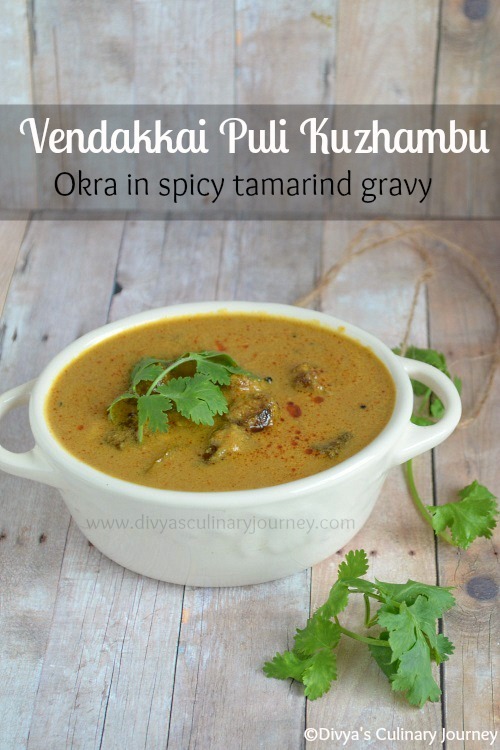 Today's recipe is Vendakkai Puli Kuzhambu. Okra is fried and simmered in a spicy tangy tamarind gravy. I make Puli Kuzhambu at least once in 15 days and is my favorite. This is kuzhambu is made with coconut. First fry the okra, keep it aside, then roast and grind fresh spices along with coconut and they are all simmered with tamarind extract and the result is a tasty flavorful kuzhambu. Using the same method, you can make variations by adding drumstick (murungakkai) for murungakkai puli kuzhambu, chickpeas (kondakadalai) for kondakadalai kuzhambu or just garlic for poondu kuzhambu, fish for meen kuzhambu and egg for egg kuzhambu or any other veggie of your choice too. Soak tamarind in warm water and extract the juice and discard the pulp. In a pan, add a teaspoon of oil, cumin seeds, then pearl onion is added and fried for a minute or two, then add the coriander seeds, red chillies and continue to roast till it is roasted and aroma starts to come, then finally add the grated coconut mix and set it aside to cool. Then grind it to fine paste. Wash and wipe the okra dry. Then chop them in 1" long pieces. Fry them in oil and set them aside. I usually shallow fry in the pan I am using to make the gravy,once okra is fried will remove it from the pan and continue the cooking in the same pan using the left over oil. Heat oil, add mustard seeds and when they crack add fenugreek seeds and curry leaves and fry for a minute or two, then add a pinch of asafoetida, turmeric powder, and then add the ground paste, along with the tamarind extract and the fried okra, then add salt to taste and adjust the consistency by adding required water and bring it to boil and let it simmer till the oil starts separating around the sides. Then turn off the heat and garnish with cilantro and serve with rice. Instead of adding coriander seeds and red chillies, you can add coriander powder and chilli powder too but add them in step 5, along with turmeric powder. If you don't have pearl onions, you can replace them with red onions too. Use personal judgement for the quantity of tamarind, since certain tamarinds are more tangier even when you use less quantity and certain tamarind are less tangier, so adjust the quantity. One of my favs.. Looks tempting & inviting ! Okra is my fav always.Curry looks great. Tempting tangy kuzhambu.. This is my favourite..
Slurp, fingerlicking kuzhambu definitely, i can have with anything. Nice dear..reminds me of theeyal which is prepared in Kerala. Una sopa exquisita,saludable y picante me gusta,muy hermosa,hugs,hugs. 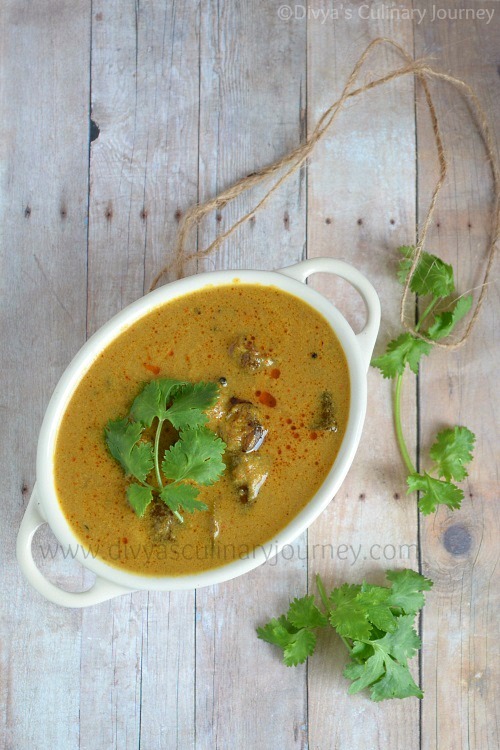 my fav okra recipe, kuzhambu looks so inviting, nice bg n clicks ! Super delicious and inviting Kuzhambu . Love it dear.